Saeed Ajmal will not make his expected return as Worcestershire's overseas player in Sunday's first home Championship game of the season against Kent at New Road. 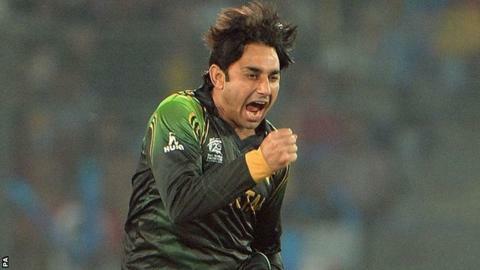 The county are still to receive a No Objection Certificate (NOC) from the Pakistan Cricket Board clearing 36-year-old spinner Ajmal to play. "It's hugely disappointing," said chief executive David Leatherdale. "You have to get the NOC before he is physically available to play." Worcestershire are not in action during the third round of County Championship matches starting on 20 April, which means Ajmal's arrival date has been put back to the home match against Derbyshire seven days later. "You are probably only talking about a few days, but we are in the hands of the Pakistan Cricket Board, who control his commitments," added Leatherdale. "After agreeing his arrival many months ago, it's disappointing not to have him here when we had originally hoped." Worcestershire, who have lost just one of their last 13 home Championship matches against Kent, have named an unchanged squad after an encouraging, rain-ruined draw in their Championship opener against Hampshire at Southampton. Young batsman Tom Kohler-Cadmore and paceman Charlie Morris look set to make their home first-class debut. Hereford-born Morris, 22, has signed for Worcestershire following three years at Oxford University. Kohler-Cadmore, 19, is highly rated, having earned the title of Wisden Schoolboy Cricketer of the Year last week, after breaking batting records in his final year at nearby Malvern College last summer, when he featured regularly for Worcestershire's Second XI. Spinner Shaaiq Choudhry, who was 12th man last week, is again included in the squad.